On February 2, 2011 when the nation’s capital woke up to a chilly morning, not many realised the excitement NSIC Exhibition Complex at Okhla would generate two or three hours later. 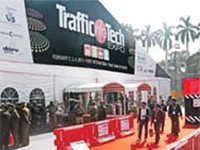 For, very soon the who’s who of the transport industry, related with road safety, traffic & transport solutions and traffic management in some way or the other, began making headway to the venue with curiosity in mind. After all, they were all going to witness India’s first integrated traffic show. anisers Afidamp Servizi Srl and Fiera Bolzano Srl – both from Italy – had lent an able support and were happy to be associated with the show. 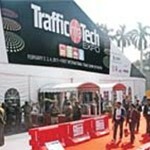 The show was supported by Ministry of Road Transport and Highways, Government of India, Central Road Research Institute (CRRI), Institute of Road Traffic Education (IRTE), Asian Professional Security Association (APSA) and Fire & Safety Association of India (FSAI). Senior officers of Government of India, National Highway Authority of India and Traffic Police, representatives of Consulates, infrastructure companies, municipal corporations, public works departments, town planners and trade visitors kept the 65 exhibitors on their toes throughout the Expo. Representatives of hotels, malls, hospitals & real estate and airport authorities and developers too came in large numbers to gain information and strike deals on parking management, guidance systems and safety. “I have called my two little sons here today so that they can see why their father has not been getting time with them at all,” exclaimed Rasmeet Kohli, Managing Director, Envoys Electronics Pvt Ltd on the last day of the show. Kohli was seen patiently explaining to the constant flow of visitors about his products — traffic signal controllers, traffic lights, pedestrian lights, VMS displays, etc. on all the three days. Infrastructure, parking & guidance systems, toll systems, road furniture, lighting, road safety products, signages, security, traffic management, highway traffic management, laboratories for traffic products, aviation, systems for railways were all at the show. Likewise, government departments, Ministry of Road Transport and Highways, Traffic Police, concessionaires, special institutes associated with transport and traffic – all the decision makers were there too. Ron Phillips, Director, Asia-Pacific (Sales), Stalker which is into law enforcement products in speed measurement of traffic, expressed similar emotions. He said on the second day, “We have just recently come from another show in Vietnam and this has four times more the visitors passing each stall. We have been running out of our visiting cards and have had them reprinted last night. We have got more than what we would expect from a trade show.” He marveled at the Indian talent in putting up a magnificent venue replete with every facility. It was not just Stalker which ran out of visiting cards, many other exhibitors had to go in for reprint as well.